Popular easily grown shrub with a rounded wide spreading shape. 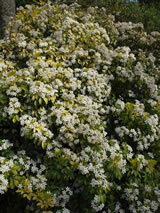 It is densely covered with bright gold to lime green aromatic leaves.Through spring and summer terminal clusters of showy white flowers look great against the gold-green foliage. On a good site it will slowly sucker to form a dense wide shrub. It can be trimmed to shape if necessary. Very hardy. Prefers a semi-shaded site.